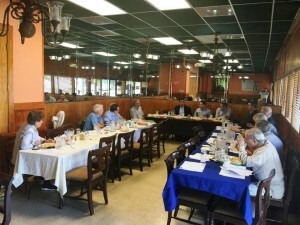 On September 12, 2015, a representation of the General Council of the movement Somos + outside Cuba had the honor and pleasure of attending a breakfast to which we were invited by Luis Mejer-Sarrá, President of the journal Cuban Cultural Heritage, and the organization Municipalities of Cuba in Exile. From Somos +, were present Carlos Hernandez-Recio (Vice President), Javier Cabrera (Organizer), Richard Cores (Economic Affairs and Investment in Cuba Group Coordinator), and Hanoi Martinez (Institutionalization Group Coordinator). Members from the city of Havana included Jesus Permuy (Chairman) and Humberto Pellon (Secretary). The invitation made to us arose from a genuine interest to meet a group of young people who share the same desire to fight to rebuild a free Cuba, where all the inherent rights of the Cuban people, rights to freedom of expression and association; to choose their own leaders; to build civic institutions to ensure their interests, and many more, are respected and institutionalized at every stage of their lives. The time that we spent with these senior ladies and gentlemen was wonderful and educational for everyone. Most of these people left Cuba when they were young at the beginning of the triumph of Fidel’s revolution. They made their life in the United States but never lost hope of one day returning to a democratic Cuba founded on the noble principles promoted by Marti. While we enjoyed a delicious coffee with milk, Cuban toast and eggs with ham, we had the opportunity to exchange ideas, principles, and anecdotes reminiscent of a family gathered at the family table. The force and the interest shown by these veterans of our homeland to share with us, made an impression on us and filled us with strength to continue communicating the ideas of our movement to young people, and those who are not so young. In our movement, in these people of advanced age, from another generation but with the same goals, we will find a receptive fertile ground to listen and learn from them. We will use their lessons, while we make our own way, based on our vision and our own methods to gain victory. Gradually Cuban youth will recover the faith and the enthusiasm for a palpable and safe return. We will also bear the torch of unity, dialogue, respect and hope, and we will propose the task of educating and encouraging them towards a better future for our country.